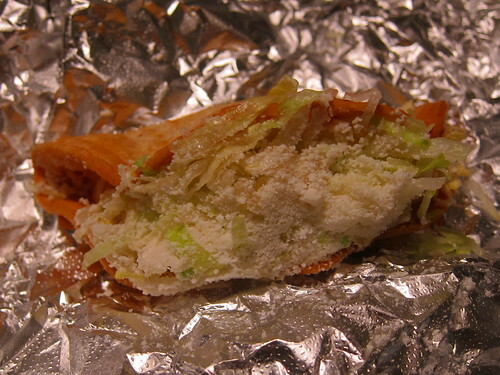 Tacomiendo is one of the Westside’s best taquerias. It may very well be the best. The menu is pretty extensive with everything from Chile Verde con Nopales and Chile Rellenos to the standard tacos, burritos, and tortas. 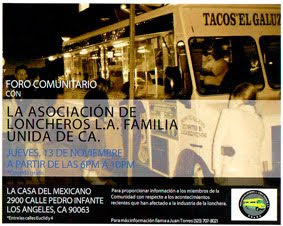 You won’t find a better carne asada taco anywhere near the Westside. The dense charred cuts of ranchera steak have the taste of the grill seared into each bite. The tortillas are homemade and packed with meat. On previous visits to Tacomiendo I made the mistake of always adding the darker salsa roja to my tacos. 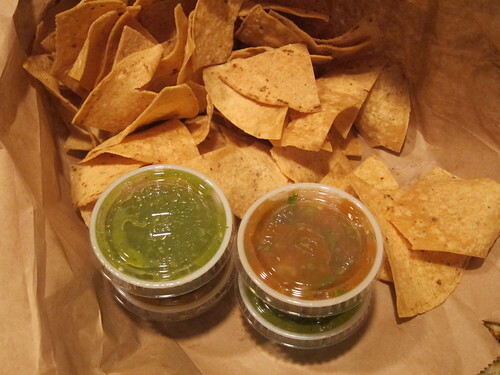 It’s not as good as the salsa verde or the orange-ish tomato and tomatillo salsa. These tacos travel well. A lot of tacos can’t survive a car ride home wrapped in foil but I actually prefer getting my tacos to go from Tacomiendo. Since they don’t use oil when grilling the tortillas the tortillas don’t wilt while wrapped in foil. The ride home wrapped up in foil also gives the tortillas time to steam a little longer. When I get home, the tacos are piping hot and waiting to be topped with onions, cilantro and salsas. Rima Lyn aka the Taco Maven has been trying to get me to eat the potato taco for quite some time. So it finally tried it. It’s good! I was expecting something greasy and stodgy but it was light with more flavor than expected. There’s cheese mixed in with the potatoes and the taco is topped with parmesan cheese. 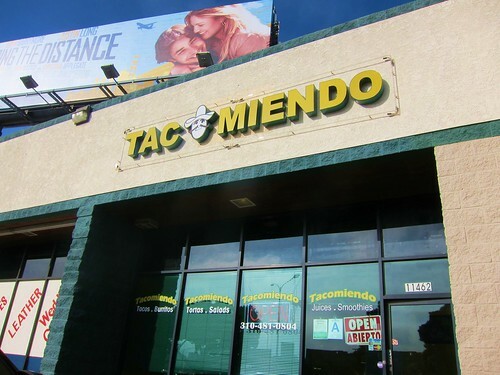 So can Westsiders honestly still complain about the lack of good tacos with Tacomiendo around? Maybe it’s just a natural reflex that we reject our local taco offerings but Tacomiendo has definitely put the Westside on the taco map. This is definitely my "go-to" spot on the west side. The Gateway location that is. I've never had a bad meal there and good call on the portability. The home-made tortillas can stand up to a long drive. I stop by this place ALL the time on my way from Santa Monica to Mid-City. The food is fresh and delish! I shared an asada burrito, carnitas taco, asada taco, and lengua taco with the boyfriend, tried everything in the salsa bar and everything was pretty unexciting. As for their homemade tortillas, they're OK. I thought the corn tortillas were too thick and a little gummy.. Not enough corn goodness. Sometimes their tortillas are pretty thick though I've had them when they were just right. 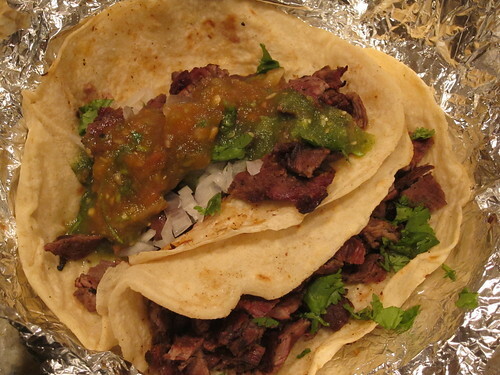 I still think the carne asada taco with salsa verde is hard to beat for the west side. Try them with pickled onions from the jalapeno container. Delish! Their burritos are just okay, but I think the tacos are exceptional. yeah had a burrito from tacomiendo this weekend. Poorly constructed (just too big) and dry ingredients: rice, pinto beans and chicken. I needed a fork to eat it which takes the fun out of eating a burrito. Yeah, as I recall, they fold a grilled green onion into the burrito, which really hurts the structural integrity. Also, I don't believe they melt the cheese on the tortilla, which is an error lots of LA taquerias make. Honestly, if you're looking for a great chicken burrito on the Westside, I don't think you can do better than Eduardo's on Westwood. I can't recommend the tacos, but the chicken Border Burrito is off the hook. 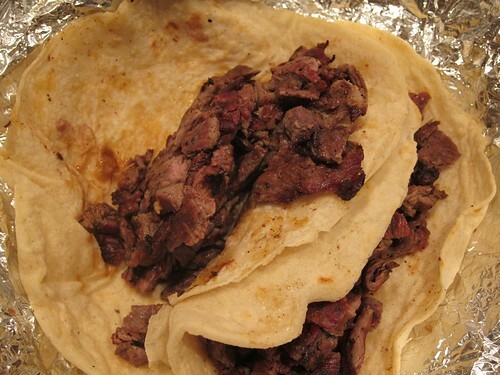 I had the carne asada burrito a few weeks ago...it was delicious!!!!! You can't go wrong with either location! 2 thumbs up!